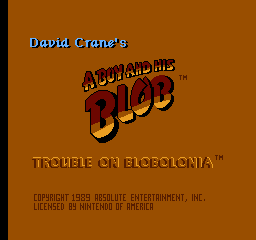 David Crane's A Boy and His Blob is the patriarch of the puzzle/platform genre. 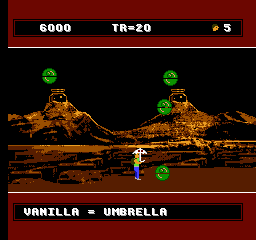 It's also one of the most bizarre and unique NES games. A simple coordinate display can be enabled with the Game Genie codes XAKKEZXY UGKKOXXK. Note that all other status bar updates will be disabled until you change screens, due to a lack of Vblank time. The first set of values is for the boy, and the second set is for the Blob. Each value represents the character's current screen number, X position, and Y position, respectively. 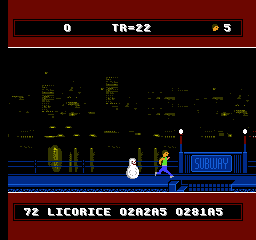 The game contains a number of unused screens, several of which are completely unique. Most appear to have been removed to make the game shorter (a strange decision, given the game's already short length). These can be seen in-game by setting RAM address $23 to the desired screen ID (set $24 to the same value or toss a ketchup jellybean to make Blob appear). Screens D2, D4, D5, and D7 are particularly odd, as they consist of a limerick in various stages of completion. Judging from the slightly suggestive ending, it was likely used to test the screen drawing code and not actually intended to appear in the final game. Screen FF is identical to the Evil King's chamber seen in-game, except the Evil King is missing. He does not normally disappear after you dump the vitamins on him, rendering this screen unused. A simple little jellyfish, probably intended to fill some of the vast emptiness of the underwater areas. A nasty-looking apple, probably intended to appear on one of the unused Blobolonian orchard screens. It seems the gingerbread men lining the walls outside the Evil King's chamber were originally supposed to attack you! How unpleasant. Screens BC and BE both feature glass jars in the background that spew large, green bubbles. Neither the jars nor bubbles appear anywhere else in the game. As is to be expected, touching a bubble means instant death. Strangely, in the Japanese version, the bubbles were replaced with vitamins. Perhaps the developers had considered resurrecting this obstacle? 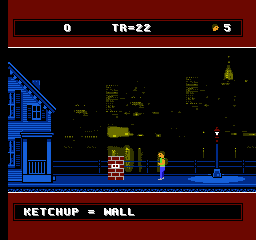 An early preview of the game in Nintendo Power featured a grape jellybean that turned Blobert into a wall, instead of the ketchup one featured in the final. A later issue then revealed a "code" to turn him into a wall by giving him a honey jellybean then switching to ketchup and tossing one in the opposite direction while the blob is transforming. This will result in a brick wall, which no longer has any use in the game. 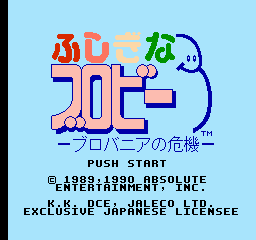 The title was given a very colorful overhaul for the Japanese release. 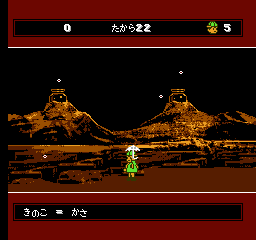 The boy was given a more cartoony (and rather out of place) look in the Japanese version. This page was last modified on 29 April 2017, at 08:49.